OHIO -- An attack by two pit bull dogs that killed a retired surgeon and severely injured one of the dogs' owners has politicians grappling for legislative measures to outlaw the dogs. Dr. William Eckman, 67, Kettering, a retired chief surgeon at Veterans' Administration Hospital, died of a heart attack suffered during Monday afternoon's 25-minute attack, the coroner's report said. Coroner's investigator J.R. Williams said Eckman was in complete cardiac arrest when he was taken to Good Samaritan Hospital and died during surgery two hours later. One of the dog's co-owners, Joetta Damstadter, 32, was in fair condition at Good Samaritan Hospital being treated for wounds she received in the attack. Dayton has a vicious dog ordinance that does not ban a specific breed of dogs but prohibits dogs that are deemed vicious. Montgomery County commissioners asked local lawmakers to speed up pending legislation that would limit vicious dogs and a Dayton city commissioner called for an ordinance prohibiting pit bulls and other attack breeds. Cincinnati passed such an ordinance last year. In Monday's incident, the pit bulls apparently attacked Damstadter inside her house, then burst from the house on the heels of Eckman, who apparently was inside the house, and attacked him in the street, authorities said. Dayton Police Maj. Edward Long said Darmstadter told him the dogs attacked her and then turned on Eckman after he tried to help her. Neighbors who saw the attack told investigators about nine people tried to subdue one dog with poles, pipes and brooms. But the dogs continued attacking Eckman until Wilbur Rutledge, the other owner, arrived, grabbed the animal and threw it into the fenced backyard of the house. Rutledge was cited for failing to obtain a dog license but Police Lt. Dan Baker said more charges could be filed after a lengthier investigation. Fire Chief Glenn Alexander said rescue workers in two medic vehicles, an ambulance and an aerial fire truck, were forced to stay in their vehicles for several minutes after arriving because of the ferocity of the attack. The dogs, weighing about 35 to 40 pounds each, were taken to the Montgomery County Animal Shelter, where they will be quarantined for 10 days to determine if they are rabid. 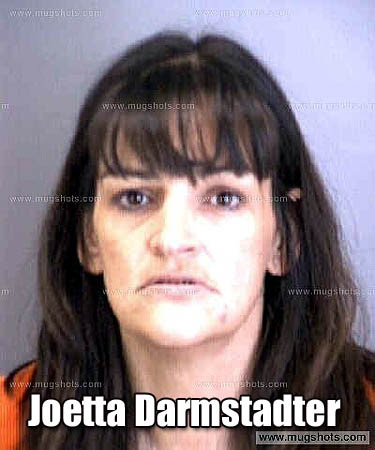 Joetta Darmstadter was booked in Collier County, FL on 2/22/2002.